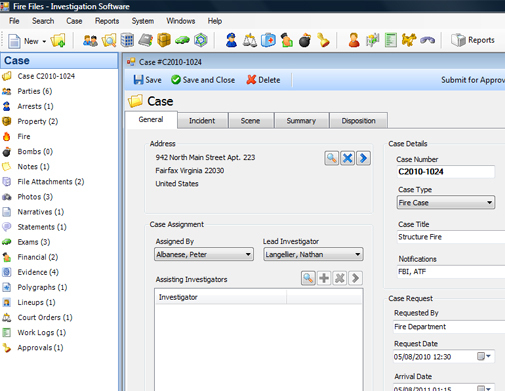 FireFiles ™ is the industry’s leading investigation records management (RMS) system for the management of police, fire, arson and bomb investigations, with 300+ clients in municipal, county and state law enforcement agencies throughout the United States. Out of the box, FireFiles includes over 20 investigation related modules and 70+ reports to assist in case management, field work, tracking, court documentation, data analysis, compliance, budgeting and statistics. This software is one of the nation's first systems designed specifically for investigators, leveraging a wide customer base to produce a records management system that is user friendly, practical and standards compliant. By moving data from paper or homegrown systems, investigators can harness the power of a scalable multi-user database system across their agency or jurisdictional boundaries. And because FireFiles works “out of the box”, information technology staff will realize a lower total cost of ownership and no need to maintain costly in-house software applications. Investigators in law enforcement agencies of all sizes can customize, manage, search and report on all data within the system, putting critical information at their fingertips, resulting in reduced costs, improved reporting and increased public safety. FireFiles follows industry standards such as: NFPA 921, NFIRS, GJXDM, NIEM, NCIC, UCR and more.